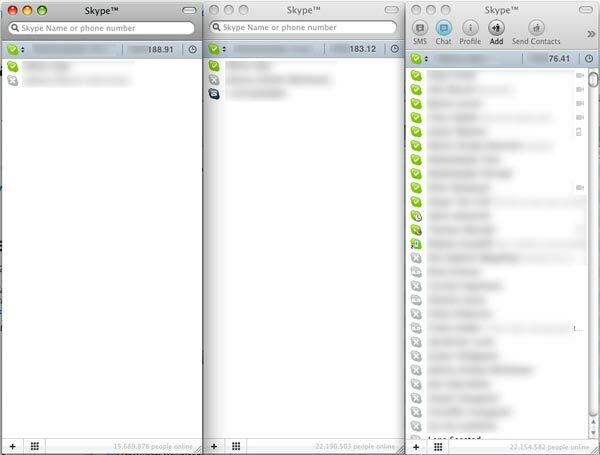 How to run more than one version of Skype simultaneously. You have several Skype accounts and want to simultaneously call from and accept calls to these different Skypeusers. 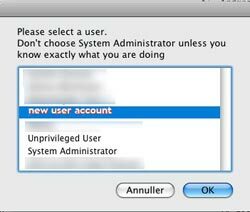 Systempreferences, Skype (more than one account), Peek-O-Matic (freeware). 3. Set up a new account. This will be used to run your extra Skypeaccount. 4. Regarding user account name make sure to give it a name that reflects its a skypeaccount user. 4c. Password: Make it easy to remember. For security reasons you should never save your user keywords in your keychain. 5. Go to Andreas Schuderer’s site http://www.schuderer.net/scripts.shtml and get a copy of Peek-O-Matic. It’s the second app from the top. Click the blue arrow to download the programme. 5a. It’s an appelscript that will run applikations as another user on the same computer without actually having to switch user. 5b. If you only have one extra Skypeaccount you only need to get one copy of the script. If you have more than one extra Skypeaccount get as many copies as you have extra accounts. To get more than one copy simply click the blue arrow several times. Your mac will automaticly rename/append new number to the download. I have three Skypaccounts so I downloaded two copies of Peek-O-Matic. 6. Move Peek-O-Matic from where you downloaded it too and onto your applikation folder. 7. Find Skype, place the mouse cursor above it, push down and hold, drag and drop the Skype icon onto Peek-O-Matic and let go of the mouse. 8. Click twice on Peek-O-Matic and choose the new user account you just created. Click OK.
8a. After which you choose “Ask on Launch”. It will ask for the new user account password each time. Better security. 8b. A new box dialog window appears. Read and click “Quit”. The application closes automaticly. 8c. If you have more than one account repeat steps 1 through 8 but with a new user account for each extra Skypeaccount you have. If you accidently throw the wrong programmes on top of Peek-O-Matic you can always start over ny dragging Skype on top.. There is no need to download new copies of the app. How to fire up all accounts. 9. First you need to start the “original” version of Skype. This is important because once the “clones” are running you wont be able to launch the “original”. 10. When the “original” is running click twice on Peek-O-Matic in your app folder. It will ask you your new user account password. Fill out the field and click OK. Skype will start to launch and you log in to Skype as you would do normally. That’s it. You should be up and running. If you have more than one extra Skypeaccount just activate the other Peek-O-Matics you’ve created. If you find it difficult to keep track of which Peek-O-Matic is which, you can replace the Peek-O-Matic icon with the Skype icon or even better create your own in Photoshop. To replace icons. Choose Skype app. in the app.folder. Select show info “Apple (cmd) + i” (simultaneously) and a box appears. Do the same with Peek-O-Matic. Click the small Skype logo at the top. Press “Apple (cmd) + C” (simultaneously). Now in Peek-O-Matic info dialogue click the Peek-O-Matic icon and press “Apple (cmd) + V” (simultaneously). Ta-da. You have a new icon. I have my Peek-O-Matic applescripts in the dock.